38 F A ll 2018 Practice l ink.com ▼ T HE C O n T r AC T S & C OMPE n SAT IO n ISSUE D E P A R T M E N T S Reform Recap J e FF at K inson Congress renews Children's Health i nsurance p rogram CHIP is funded primarily by the federal government; states operate the program following federal guidelines. C on G ress rene W e D t H e CH i LD ren ' s H ea L t H ins U ran C e pro G ram (CH ip ) for an additional six years in January. The program provides free or low-cost insurance for 8.9 million children in low- and moderate-income families. Those families earn too much to qualify for Medicaid, but have difficulty affording or accessing private insurance. The Medicaid program covers 26.8 million more children. 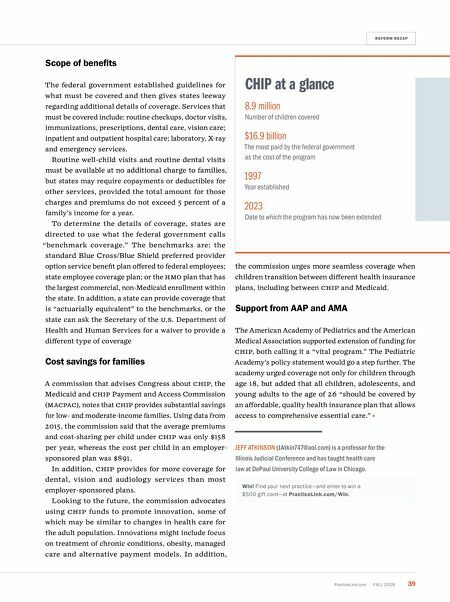 At the states' option, C h IP also can provide coverage to pregnant women. Bipartisan support C h IP was enacted in 1997 during the Clinton presidency with strong bipartisan support. The program helped reduce the percentage of children in the United States without health insurance from 14 to 4.5 percent. 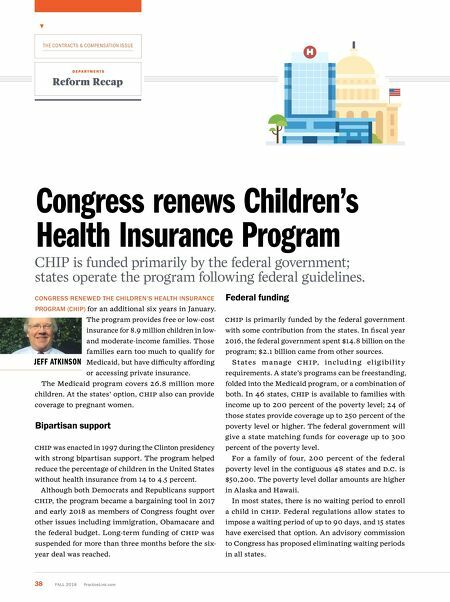 Although both Democrats and Republicans support C h IP, the program became a bargaining tool in 2017 and early 2018 as members of Congress fought over other issues including immigration, Obamacare and the federal budget. Long-term funding of C h IP was suspended for more than three months before the six- year deal was reached. Federal funding C h IP is primarily funded by the federal government with some contribution from the states. In fiscal year 2016, the federal government spent $14.8 billion on the program; $2.1 billion came from other sources. States m a n a ge C h I P, i nclud i ng el ig ibi l it y requirements. A state's programs can be freestanding, folded into the Medicaid program, or a combination of both. In 46 states, C h IP is available to families with income up to 200 percent of the poverty level; 24 of those states provide coverage up to 250 percent of the poverty level or higher. The federal government will give a state matching funds for coverage up to 300 percent of the poverty level. For a family of four, 200 percent of the federal poverty level in the contiguous 48 states and D.C. is $50,200. The poverty level dollar amounts are higher in Alaska and Hawaii. In most states, there is no waiting period to enroll a child in C h IP. Federal regulations allow states to impose a waiting period of up to 90 days, and 15 states have exercised that option. An advisory commission to Congress has proposed eliminating waiting periods in all states.